In case you have’t heard, white ink tattoos have been all the rage lately, with celebrities like Lindsay Lohan, Ellie Goulding, and Kate Moss sporting nearly translucent ink. But before you rush out and get one, there are a few important facts you should know first. What is a white ink tattoo? It’s a special tattooing process that uses white pigmentation instead of traditional colored ink. According to White Ink Tattoos Center, there are three main methods, the first is applying a dark ink on the skin and then stenciling on top; the second is filling a needle with water that draws the blood out on the design; the third is to draw the design on freehand with white ink. Most artists agree freehand is the best and safest method, but it’s also the most difficult one because white ink is extremely hard to see. Since white ink is much harder to work with, getting a white tattoo is far more tedious than getting a traditional tattoo. Does it show up on dark skin? Unfortunately, this fad is pretty exclusionary. White tattoos show up best on fair complexions because the ink often ends up a beige or light brown on darker skin tones. 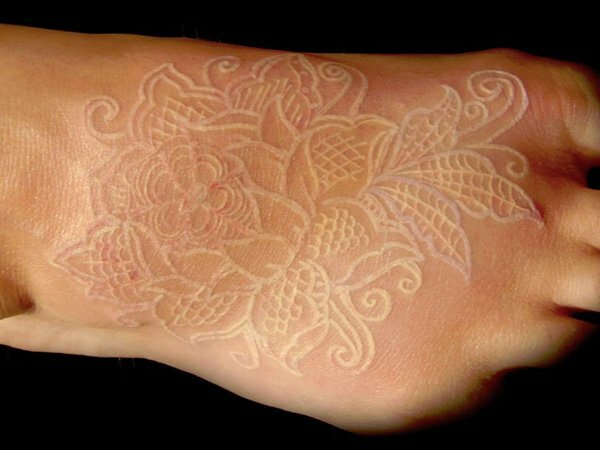 Once the tattoo is completed, it appears as a scar a shade lighter than your natural skin tone, looking more like three dimensional branding than a two dimensional image. Results may vary from person to person depending on the type of skin you have. White ink tattoos look more subtle than traditional ones and are often easier to mask — making them an option for those who work in conservative environments or are interviewing for jobs. But if your employer is so uptight they don’t even allow small tattoos, maybe it’s time to quit? It’s very difficult to keep the color “white” while transferring the ink onto the skin. Even the most adept tattoo artists have this problem. Many times, the tattoos end up looking raised, yellowed, pink, or even invisible. Imagine spending hundreds, or even thousands, of dollars on something that can’t be seen. Talk about the emperor’s new clothes! If the tattoo artist does manage to transfer the pigment successfully, there are no guarantees the tattoo will heal correctly. Sometimes the color comes out white, others end up with a yellowish color, while in others, the pigment shows up as transparent. 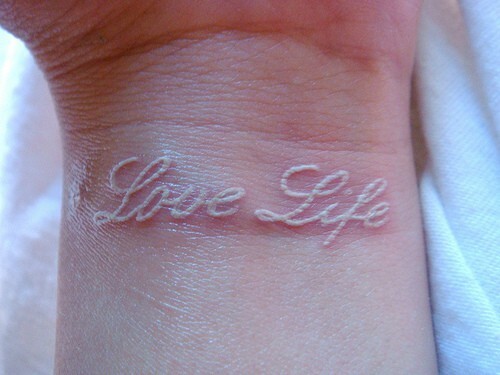 The worst case would be a raised white tattoo that looks more like an allergic reaction that a piece of art. There’s also an added chemical risk. Dr. Mercola, of Mercola.com, says white ink contains hazardous toxins like lead carbonate, anatase, titanium dioxide, and rutile, which may cause cancer. Though, there are not enough scientific studies of white ink tattoos to conclude they are lethal. But why take the chance? White ink tattoos need far more upkeep than traditional ones because the ink tends to fade quickly and needs constant touchups. If you do get a white ink tattoo, be sure to stay out of the sun or glob on the sunscreen when outdoors. 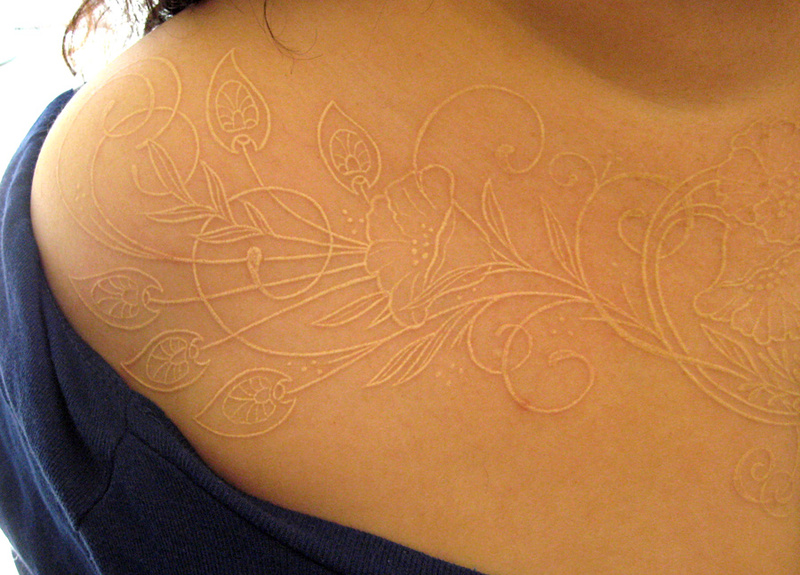 White ink tattoos are perfect for red heads, or those with ivory skin. Both traditional ink and white ink tattoos contain toxins, but there is less scientific evidence regarding the latter. If you’re dead set on getting a white tattoo, be sure to do your research and understand what you’re getting yourself into because chances are, the result will be slightly different than what you had in mind. Does anyone plan on getting a white tattoo? If you already have one, what were the results?